Quico says: More and more, Rafael Ramírez’s speech to PDVSA management has made me think about the way chavismo uses the word “revolution” to flatten the distinctions between state, government, homeland, pueblo and leader – conceptual distinctions vital to a free society. “Public employees are at the service of the State and not of any partiality,” the constitution tells us. But a Revolution cannot think of itself as a “partiality” – it must think of itself as the quasi-mystical political incarnation of the people, its essence and its interests. The Revolution is the state. It makes no sense, within a revolutionary mindframe, to posit a distinction between Chavez’s interests and the interests of the people, the homeland or the state: they’re one and the same. In fact, that unity is what the word denotes, its deep meaning. In a Revolution, state = government = homeland = people = leader. If you accept that, it follows that dissenting from the leader is tantamount to treason against the state. Once you’ve conflated these ideas into a single, undifferentiated soup, you pull out all the conceptual stops that restrain a government from tyranny. In this way, the word “Revolution” has become a trump-card, a conceptual bulldozer plowing over all spaces for legitimate dissent. 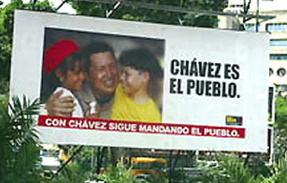 Ramirez is explicit about this: “we were put here by the Revolution, we were put here by the pueblo, we were put here by President Chavez.” You can’t pick and choose between them, because they’re basically the same thing – a kind of revolutionary Holy Trinity. There’s no room in this vision for NiNis, for “light” supporters. To be “a little bit revolutionary” is to be a little bit of a traitor. It just won’t do. Anything short of total, unthinking support for the Revolution makes you an enemy of the people. Your conscience doesn’t belong to you, it belongs to us…well, to him. And if you hold back, even a little, if you don’t quite surrender your will in its entirety, you become suspect, an enemy to be liquidated. It’s a road that leads to tyranny, and nowhere else.